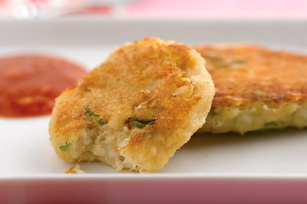 No dicing or chopping necessary for these moist, tasty crab cakes. Plus this make-ahead appetizer can be refrigerated or even frozen before baking! Beat egg and dressing in large bowl with whisk until well blended. Stir in crabmeat. Add remaining ingredients; mix well. Let stand 3 min. Shape into 24 patties, using 1 Tbsp. crab mixture for each. Place on baking sheet sprayed with cooking spray. Bake 5 to 7 min. on each side or until heated through. For less heat, omit the cayenne pepper. Instead of baking the patties, cook them, in batches if necessary, in large nonstick skillet sprayed with cooking spray on medium heat 3 min. on each side or until heated through and golden brown on both sides. Prepare using Kraft Calorie-Wise Rancher's Choice Dressing and Kraft 100% Light Parmesan Grated Cheese.